Jakob Friis explains how his company Meptek uses a 360 degree camera and Virtual Reality goggles to improve their student’s ability to give better presentations. Today’s technology now makes it possible to immerse yourself into Virtual Reality (VR) to experience almost any of life’s experiences. Although VR is still in its early development stages, it has been around for a long time. Just look at the aviation and gaming industries. Early aviation training utilized radiometric VR, with such devices as the Link Trainers, which provided WWII pilots with VR experiences without leaving the ground. Games have advanced exponentially with the aid of computer technology. Advancements continue and we can only imagine where it will take us. Jakob Friis expertly outlined the definition and the whys and uses of VR at the Club’s Sunday meeting. He also provided hands-on devices he uses in his business. 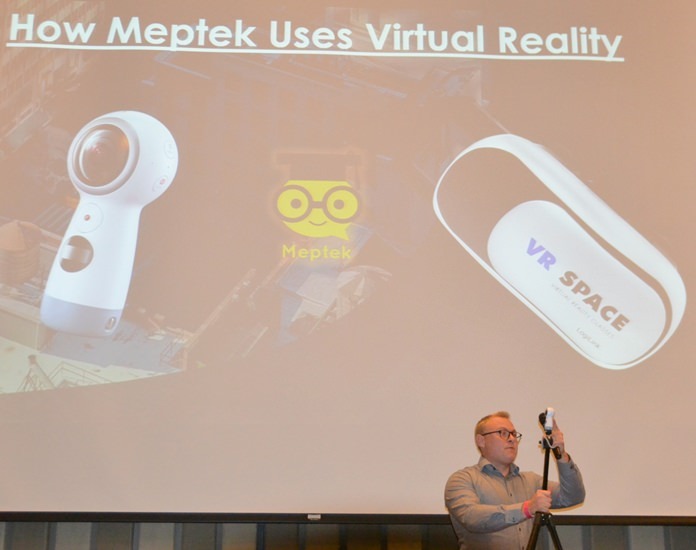 The business he started is called Meptek where he is a partner and the Virtual Reality expert. Meptek is a training business that provides a variety of courses for both educational institutions as well as private businesses. He has had the business for almost 3 years now and so far, he has taught at one of the most prestigious private schools in Oxford – England, The Copenhagen Marriott Hotel and at some of the biggest companies such as FLSmidth in Denmark. He has become an expert in VR and uses this technology in his business. Jakob Friis explains how Virtual Reality technology continues to improve and describes its impact on your life today and in the future. So, what is VR? It is simply a computer-generated simulation of a three-dimensional image or environment that can be interacted in a seemingly real or physical way. A person uses special electronic equipment, such as a helmet, with a screen inside or gloves fitted with sensors which helps the user practice and prepare for the future. 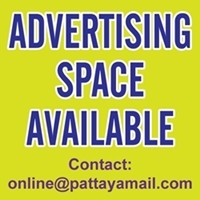 Uses are limited only to today’s technology, cost and imagination. VR is advancing quickly but it isn’t mainstream…yet. Jakob’s passion is public speaking and training. He was drawn to Virtual Reality, initially as a hobby, but soon found that this technology fits his business exceptionally well. He utilizes what he calls a “Magic Tool.” This is a 360-degree camera that has two, 180-degree cameras, mounted on a tripod. When activated, two video images cover a full 360-degree circle. The images are then electronically, seamlessly, “stitched” to provide the user, using a specially designed pair of goggles, the ability to look in any direction, by simply turning your head and view the area as if you are sitting in the room. He uses this VR camera to record a student’s presentation, then he has the student put on the goggles and critique his own presentation as if he were sitting in the audience. He uses it to help the student look for such issues as monotone voice, body language, facial expressions, talking too fast/slow, and audience reactions. All this is in almost real-time, allowing very quick feedback, allowing the student make corrections, on the spot. Uses beyond training were also discussed. For example, the 360-degree camera is now used in the real estate industry. A potential buyer can wear the goggles and experience what it would be like to live in the house, from a remote location, perhaps form another country. Car sales-people are now able to let you see what it feels like to be in a car that you might be interested in. With the goggles you can look at the dash displays and the interior without actually being at the dealership. Jakob Friis before his presentation invited PCEC members and guests to try on some of the Virtual Reality goggles he brought with him to experience its wonders. Here, member Jim Johnson is thoroughly enjoying the experience. Nursing home residents may find this technology to be life changing. The elderly generally have extensive life experiences and would like to revisit exciting places, but due to physical limitations they can’t. 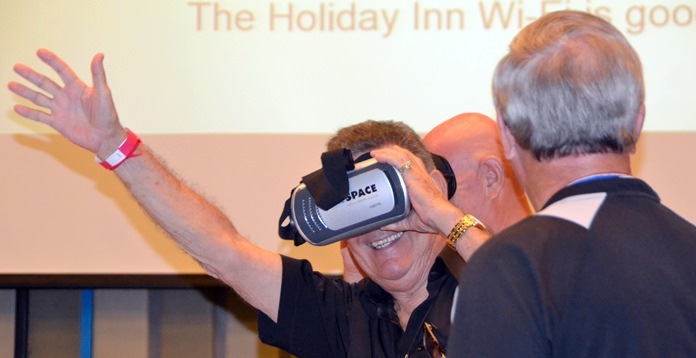 With VR, they can re-visit their travels or go places they have always wanted to go. Studies show that providing happiness to the elderly increases their quality of life, provides less lonesomeness and will increase life expectancy. This could truly change the lives of many of the elderly. The talk was very well received and the audience had many questions about the potential uses of virtual reality as well as the dangers of it becoming extremely popular in recent years. Jakob reassured the audience that the same has been said about the laptop, mobile phone and other technologies when they first were introduced to the public. Over time the public will become more and more accepting of the technology as they could see the benefit of it, especially in the educational and medical sector. 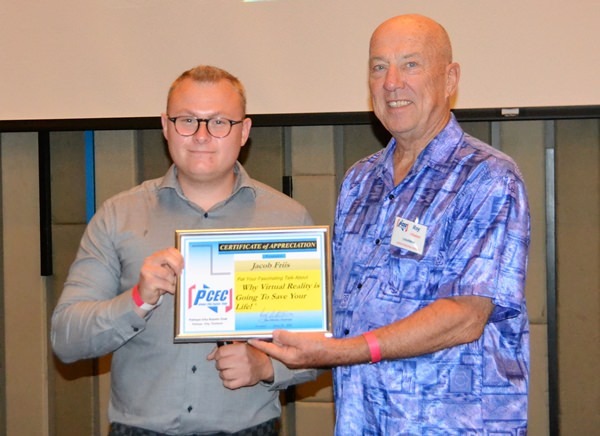 MC Roy Albiston presents Jakob Friis with the PCEC’s Certificate of Appreciation for his informative and interesting talk about Virtual Reality and its benefits. In the educational sector virtual reality can increase learning retention due to the much more detailed experience the technology provides in comparison with a textbook. In the medical sector surgeons are able to perform procedures in virtual reality where they can gain experience and knowledge about the procedure as well as train for worst-case scenarios before performing the actual procedure with a patient. This is most comparable with flight simulation training that an airplane pilot must go through in order to be allowed to fly the aircraft. Member Ren Lexander during his post presentation interview of Jakob Friis tries on a set of Virtual Reality goggles for a firsthand experience of what the technology is all about. To view the video, visit https://www.youtube.com/watch?v=uoM1h8eDrpg& feature=youtu.be. 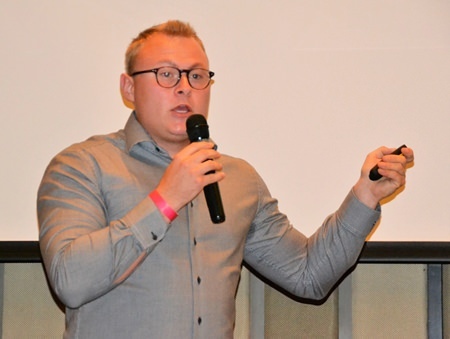 After Jakob’s presentation, MC Roy Albiston brought everyone up to date on upcoming events which was followed by the Open Forum where members and guests can ask questions or make comments about Expat living in Thailand. For more on the PCEC and their activities or to subscribe to their weekly newsletter, visit www.pcec.club.